Our Platinum Cricket Week could not have gone better! The perfect weather and lots of cricket made for a very fun and special week. All the results and match reports can be found on our website but we must thank all the opposition we played and all of our players too! Thanks must also go to the Nunns & Parkers for helping set up the matches and ensuring everything was ready. The highlight of cricket week was the close game between the Green & the Two Counties over 50’s. 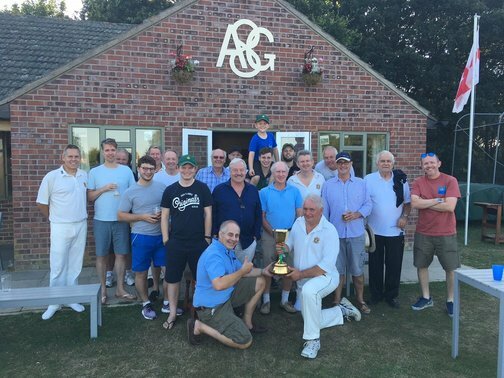 Not only was the cricket fascinating we had Colchester Brewery Beer on tap, old faces returning, a sizzilng BBQ & the Championship Trophy on display for everyone to see! Thanks must go to Graham Pryke for bringing that up too. Pictures can be found on our website here. A 72 run victory secured upon the back of a super century for JP, well-backed by Richard Polley whose 75 contributed to an opening partnership of 151, while Tom Lee hit 55 as he continued his high-scoring season across the various age groups. JP also picked up three wickets, ably supported by Matt Murray with three of his own. This performance from Jonathan Purser rightfully saw him win the Colchester Brewery Man of the Match! Selection issues are a real problem with every club these days especially for a Sunday but every cloud.. The lack of players available on a Sunday saw Ethan Wyatt (U13) ,Ollie Licence (U15) & Connor Murphy (U13) all step up for the Green and contribute on Sunday. Ethan took his first senior wicket to the delight of his father Duncan who was at mid on. Ethan also took a great catch off Sam Pace’s bowling at point! Ollie took 2 wickets which surprised the Saturday 2’s players as they had never seen him bowl! Finally Connor provided some entertainment with the bat. It was great to see the youth players showing up some of the seniors even worrying a few of them! Hopefully we can continue to use Sunday as a step up to senior cricket. Kiwki Bevin Guthrie was awarded a special EAGGC cap engraved with “BG70” as he celebrates his 70th birthday! It was presented to him after the Two Counties game and he hasn’t been spotted without it since! We wish all the best & a safe trip home for Bev who goes back to New Zealand. We hope to see you back up the Green again! The 1’s were given a good lesson on Saturday on how to win games in this Division by the league leaders. A stronger Felixstowe team from the team we previously played showed us how to bat well, bowl well & field well. We now go up against Halstead on Saturday at the Green before the crucial game against Stowmarket the next week! Congratulations to 1s XI skipper Keith Hammond who married Elsbeth last Friday and further congratulations for fitting it into cricket week! Also well done to Matt, James & Andrew for providing some memorable entertainment during the night in the form of 3 Wide Balls.